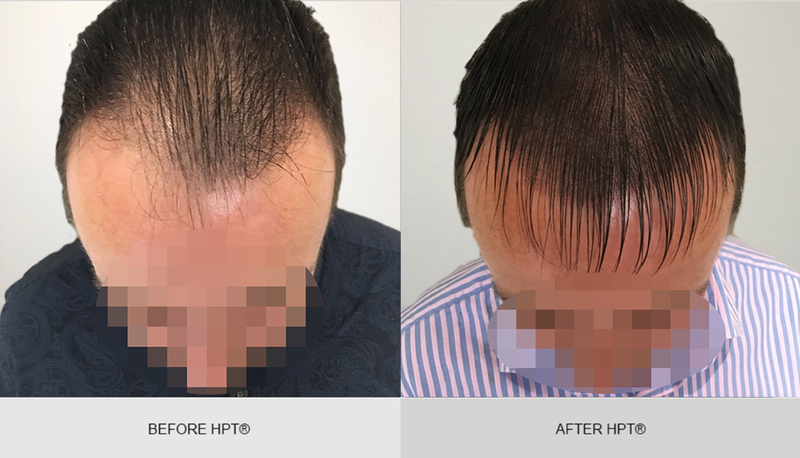 HPT® scalp micro-pigmentation can create the illusion of either denser looking hair, creating a hairline or even full head coverage ‘shaven look’ which previously may have been unachievable with other hair loss solutions. The hairline is the most important part of your scalp micro-pigmentation treatment, as this is the focal point, and will determine the overall look. If not done correctly the treatment will look unnatural and fake. Our experienced technician will work with you to design, mark, measure and approve each hairline before any pigment is implanted. Some patients may wish for a very defined hairline, but we often advise them to try a more natural look that takes into account age-appropriateness and ethnicity. 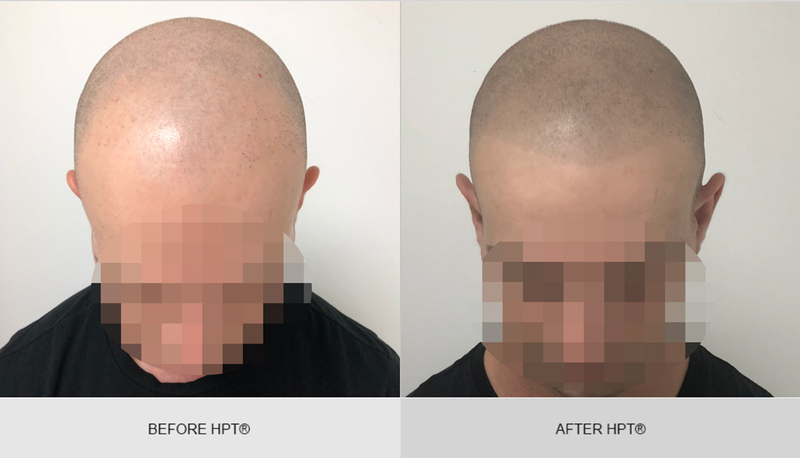 HPT® scalp micro-pigmentation is a cost effective hair loss solution to give you the ‘coverage’ you want, whilst deciding which transplant surgery is right for you. HPT® scalp micro-pigmentation can also enhance any successful transplant surgery, either Follicular Unit Extraction (FUE) of Follicular Unit Transplantation (FUT), by creating the illusion of thicker ‘hair’ at root level and infilling between transplanted grafts. 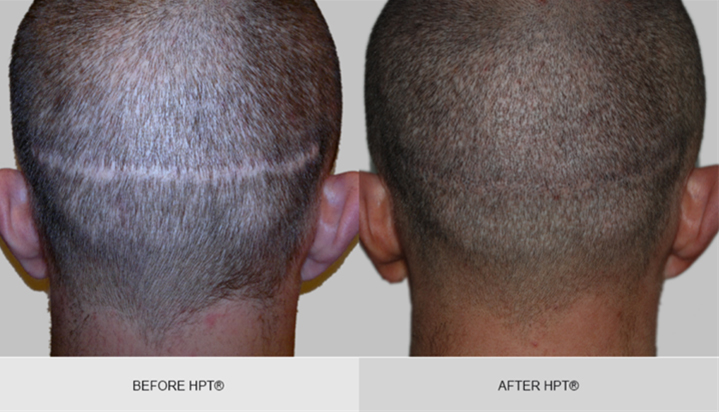 HPT® scalp micro-pigmentation has been effectively used on a number of patients to camouflage scarring; either strip scarring, hole punch or plug marks left after hair transplant surgery. The pigment is implanted into the scar tissue, matching the hair follicles and hair surrounding it and depending on the type of scar that needs camouflaging the pigment will be blended into the hair surrounding the scar for a more natural look. Scar tissue is very different in composition to that of healthy skin and can be unpredictable in how it reacts to scalp micro-pigmentation treatment and retention of the implanted pigment. HPT® is only appropriate for the treatment of scars more than a year old which have fully healed. I visited Anouska, & Christian early last year. Anouska was extremely thorough in explaining the process from start to finish.Initially, due to my skin complexion and the way my body absorbs ink - I required 4 more sessions than usual - I was never charged a penny more, and the team were determined to achieve the desired result.I genuinely could not be happier with the results. I've even had 2 professional barbers comment to say, they have not seen a better example of this treatment.I can not stress how fantastic the service and process was throughout. I was very nervous about the whole procedure. But once I met Anouska, I felt very relaxed and way more confident, because of her amazing knowledge & experience in the field of scalp pigmentation. The results are brilliant and I cannot thank Anouska enough for all her hard work and effort. Thank you. I was losing my confidence and still very young... She put me through everything... Very intelligent, excellent listening skills to needs and much cheaper...The end result was like gold 磊..... I look really really handsome..... So confident...... She is really good at what she does and she is not too expensive... Very affordable compare to the rest...... She is an expert.... You cant even tell that i did an hair pigmentation.... It looks so real.And i did mine about 3 years ago... Still looking really good. I was thinking about a treatment like this for a while when I decided to contact Hair Ink. Even though I wanted to do it, I had many doubts about it but Anouska is incredibly attentive and professional. Always straight forward, she explained everything and repeated as many times as I needed to understand all the process. She is nice and approachable and the results of the treatment are over the top and very realistic. Also, she made it very easy to adapt it to my economic situation. If anyone is thinking about getting a similar treatment, look no more and contact her. Fantastic. Consultation was detailed and really took into account my needs. Anouska and Christian really care about what they do and the results are brilliant. Highly recommended. It was my first and only time having any kind of cosmetic procedure carried out. I found Anouska to be professional in the way she handled the process from the first session to the last. Although professional, she is also very friendly and puts you at ease with her chatty and friendly nature. She is passionate about the quality of her work and is only satisfied if you are happy with the work so look no further! An excellent service. Anouska is extremely knowledgeable and experienced in her field; she advises well to ensure you get the most natural looking outcome. Her micro-pigmentation technique is far superior compared to other people’s treatments and results I’ve seen. I was thrilled with my results. I regained so much more confidence, and it wasn’t blatantly obvious I’d had it done. She done a fantastic job. I can’t recommend HAIR ink and Anouska highly enough! © Copyright 2019 HAIR ink.